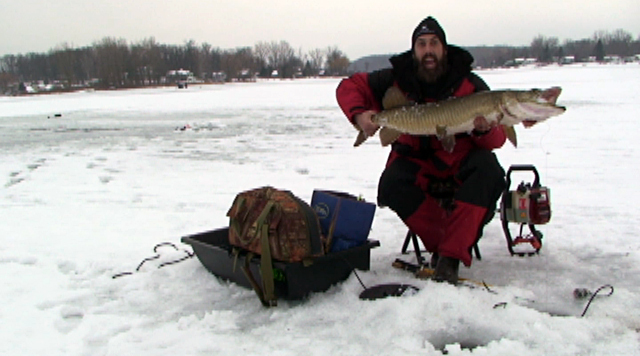 GreatLakesIceFishing.com anglers rely on K & E Stopper Lures for our ice fishing success stories! One of the hottest new ice fishing jigs on the market – Skandia Tungsten Jig kits contain 11 total pieces featuring all your favorite sizes and colors, and super sharp white nickel hooks at one great price! 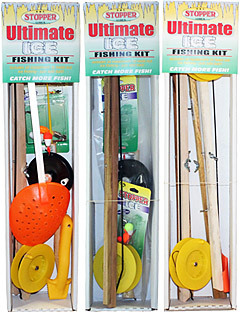 Three different complete ice fishing kits will have you on the ice catching fish in no time! 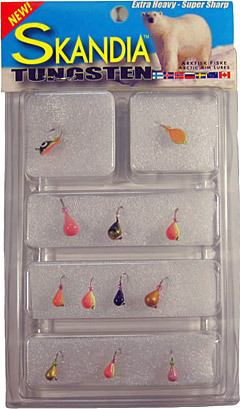 Kit RS incluces an ice rod/reel, tip-up, skimmer, scaler, line and jigs. Kit RT includes an ice rod/reel, tip-up, line and jigs, and Kit TT includes two tip-ups. Your choice! Wonderbread Skandia Pelkie Tungsten Ice Jigs! - For a limited run, Skandia Pelkie jigs are now available in the popular Wonderbread color (178) through the Anglers Mart website at www.anglersmart.com. Skandia Tungsten Tear Drops Equal Success! - The New Skandia Tungsten Tear Drop ice jigs are lighting it up. Reports are coming in on the latest tungsten innovation from Skandia and fish are hitting the ice! Visit the Ice Fishing Forum too! More tips from K&E Stopper Lures on Facebook! * Note – GreatLakesIceFishing.com (GLIF) does not make or directly sell any of these brands nor do we run or own K & E Stopper Lures or Anglers Mart. They are advertising partners for us. For more information on partnerships and how we may benefit from them please see our Disclosure Policy. For more product information on the above products you do not find covered on GLIF visit www.StopperLures.com.